Keep your survival kit stocked with this breakfast bucket to ensure you have nutritious meals in the event of an emergency. 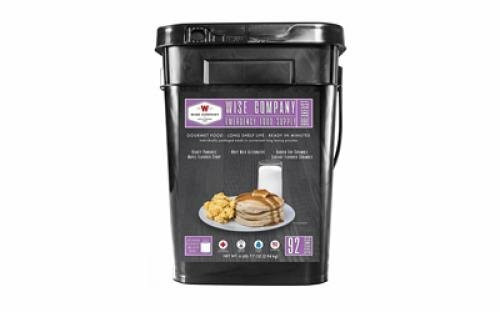 This contents of this bucket have a shelf life of 25 years and include egg and sausage scramble, garden scramble, pancake mix, maple syrup mix, and powdered milk for a complete meal. Exact color: black. If you have any questions about this product by Wise Company, contact us by completing and submitting the form below. If you are looking for a specif part number, please include it with your message.